My firewood shed has a concrete floor with 32" concrete walls because it is built in the ground. It has a roof and has 2 walls open. The other walls are closed. All my firewood that's stored below grade level is moldy. Is the concrete causing this? Is there any way to fix this? I don't believe it's the actual concrete that's causing your firewood to mold, but the concrete structure that's below ground level is definitely the culprit. I have a lean-to structure attached to my pole barn that has a concrete floor and I consistently stack my firewood right on top of the concrete and have never had a problem with mold. However, my concrete floor is at ground level and it does not sit below the ground like the one you describe. With a concrete floor surrounded by a 32 inches of concrete wall it's almost like a basement in a house. Firewood needs two basic things to dry out…….air flow and sunlight. Since the bottom layer of wood is stored below ground level and surrounded by solid concrete on all sides I suspect it's not getting any air flow or sunlight. Just like a basement in a house will become damp, the bottom layer of your firewood shed is exposed to the same conditions. Damp or wet firewood stored in these conditions without any air flow or sunlight to dry it out, and keep it dry, will eventually develop mold. I'm not sure there's an easy fix to your problem but I do have a few suggestions. One solution would be to install some type of flooring to lift the bottom layer of firewood up near ground level. However, with a 32 inch difference in height this would probably require a lot of material and labor since you will be building a whole new floor. Depending on the actual size of your firewood shed (if it's not too big) you could get some pallets and stack them on the bottom about 2 or 3 pallets deep. Then just stack the firewood on top of the pallets. 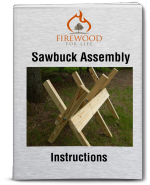 With the pallets on the bottom it will not only lift the firewood up a little, but it will allow air to circulate underneath it, helping it stay dry. Anything you can do to lift the firewood up a little and allow air to circulate underneath will help prevent the mold from growing. There's probably a handful of other things you can do to lift the firewood up, it just depends on how involved and labor intensive you want to get. I think the pallets are probably the easiest and cheapest solution. Even though I don't elevate my firewood off my cement floor, once you have the new floor poured I would recommend you do just to be on the safe side. Every location varies with the amount of sunlight and wind a piece of firewood is exposed to. Like I mentioned before, pallets work great but I usually just use a piece of 2x4 or 1x1 lumber and lay two pieces on the ground parallel to each other (like train tracks). Then just stack your firewood in rows on top of the lumber. By stacking your firewood on the lumber it allows air to circulate under the firewood. By stacking the firewood in rows is allows air to flow between the firewood stacks. It's just another way to insure your firewood won't mold. I think I will fill it up with sand and then pour another concrete floor on top, at ground level. It's just maddening. I did a lot of work to do it that way. My house is built in a hill that's the reason I did it that way. It goes good, I pitch my wood in from my drive way on top and then I can trow it in the basement from there. I'll have to pour myself a concrete chute in my basement wall I guess before I fill it with sand.